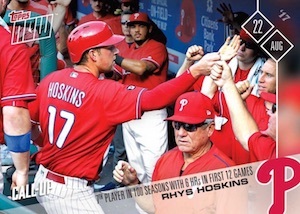 The long ball is always in demand and interest has surged for Rhys Hoskins rookie cards based on his early MLB success with the Philadelphia Phillies. 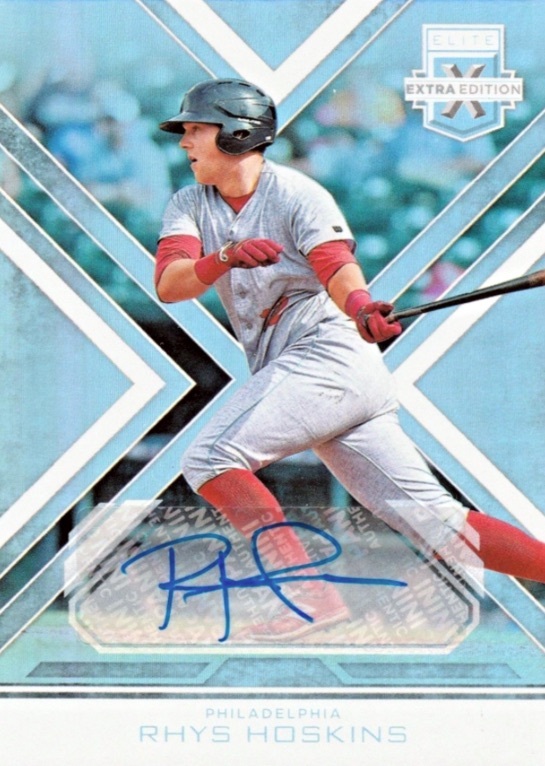 Although collectors have to wait for 2018 products to pull his official rookie releases, there are still a few Rhys Hoskins cards to keep fans covered until then. Taken in the fifth round of the 2014 MLB Draft, Hoskins' path to the majors stretched across several years. He finally got the call on August 10, 2017, and has electrified fans and collectors with a torrid home run pace that saw him set the all-time record with 18 bombs in his first 34 games. He notched 39 RBI during the span, which is also a record start. Shop for Rhys Hoskins autographs and apparel on Fanatics. Despite several years in the minor leagues, Rhys Hoskins cards from 2014 to 2016 are fairly minimal. In even less supply are his autograph cards. However, it shouldn't remain that way for long. Topps already revealed that he has a base rookie in 2018 Topps Series 1, and it wouldn't be a shock if the floodgates start to open soon. Buy specific cards or track prices using the links below. Linked products in the body go straight to detailed set profiles. 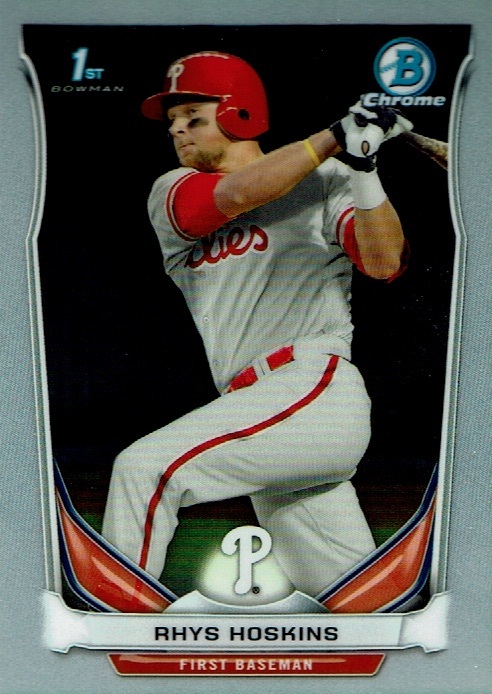 The first Rhys Hoskins card debuted in 2014 Bowman Draft. While it does not come in a signed edition like so many of the popular Bowman offerings, the base paper and parallel cards give way to Chrome and Refractor versions. These are the most pursued of the bunch. 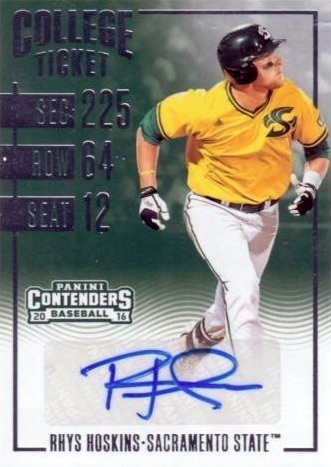 A very similar card comes in the 2014 Bowman Chrome Mini factory set, but obviously in a smaller size. It took nearly two years for the first Rhys Hoskins autographs to enter the hobby, courtesy of 2016 Elite Extra Edition. In addition to the base silver card, a whole mess of colorful parallels, including Aspirations and Status die-cuts, each bring the individual rarity to 100 copies or less. Also found in the EEE set from 2016, the Contenders College Ticket insert offers an alternative to the airbrushed base autograph. Revisiting his days with the Sacramento State Hornets, Hoskins is shown in his collegiate uniform. While there is no listed print run for the base College Ticket, low-numbered parallels include Cracked Ice (#/24), Playoff Ticket (#/15), Championship Ticket (1/1) and the printing plates (1/1). 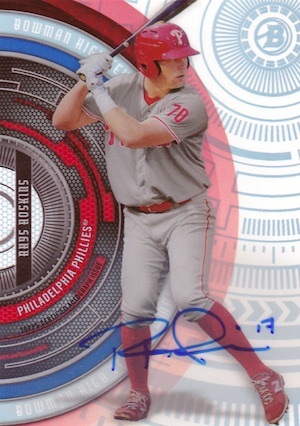 It's not the Bowman autograph that collectors most want, but 2017 Bowman High Tek is the first signed option for Rhys Hoskins from the popular prospect brand. The acetate card is hard-signed with several low-numbered parallels, and Hoskins has a base card, as well. Given the relative void of early Rhys Hoskins autographs, collectors have to dig a little deeper. One such example is part of the 2017 Panini NSCC wrapper redemption promo. Limited to just 10 copies, the manufactured patch is directly signed by Hoskins. This card also takes a college approach using the same image from the Contenders card. Although noted as a "Call-Up," this 2017 Topps Now Baseball release is as close as you can get to a real-time Rhys Hoskins rookie card. Documenting his sixth home run in his first 12 games, the card sold 1,247 copies. 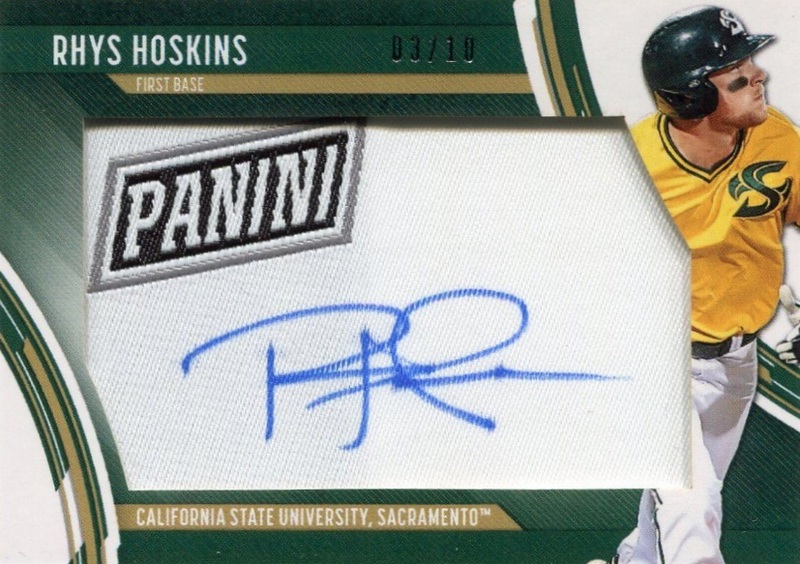 Several more Now cards have also been issued for Hoskins based on his prolonged power display. 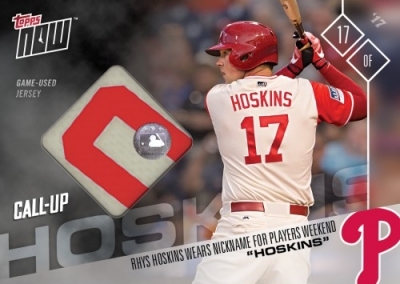 This includes a game-used swatch card from his "Hoskins" nickname jersey that was issued in the 2017 Topps Now MLB Players Weekend Jersey Relics set. 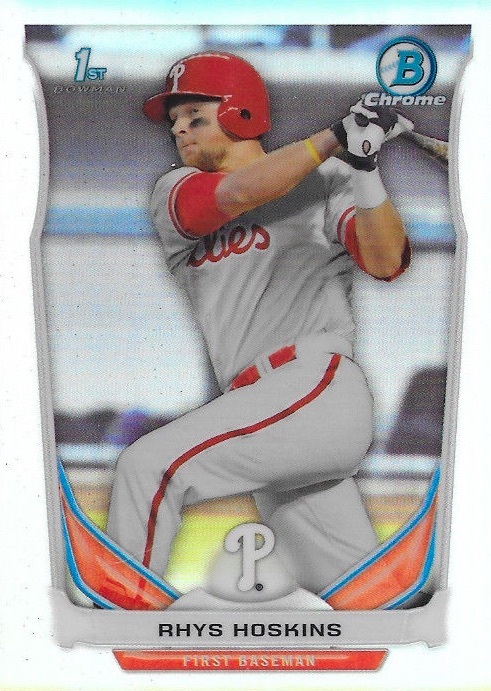 Hoskins could still have an official rookie card in of the upcoming 2017 sets, though Topps and Panini seem to be keeping eligible rookies out of their late sets to create hype for the following years sets.